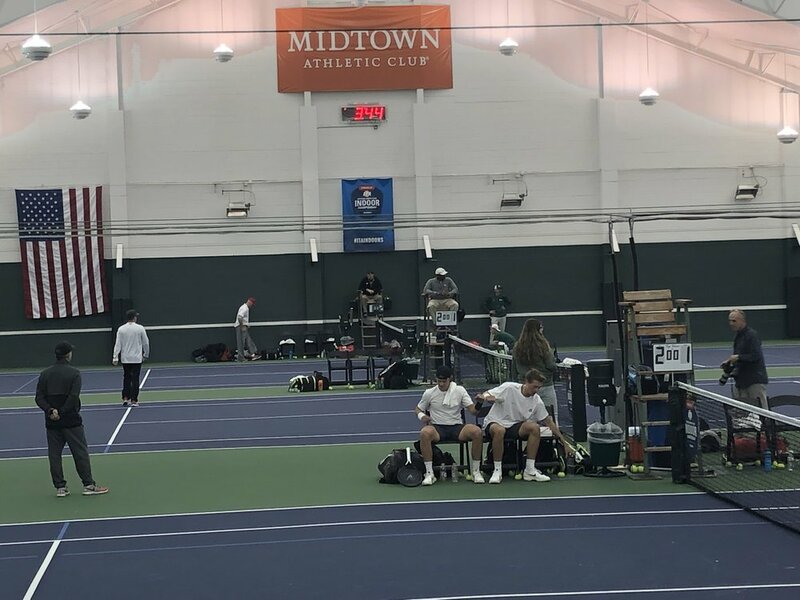 This past weekend The 2019 ITA National Men's Team Indoor Championships was held at the Midtown Athletic Club in Chicago, Illinois. The best 16 teams from across the country came together to compete for the National Title and Sports Interiors was able to be a part of all the exciting action that unfolded. In a rematch of last years NCAA team title match Ohio State and Wake Forest made it to the finals after fierce competition from all the other teams that attended the competition. After a back-and-forth doubles series The Ohio State were able to secure the vital point and with it the 1-0 advantage headed into singles play. JJ Wolf was able to dominate in his match and win the second point for this team, beating Borno Gojo 6-0, 6-3 & shortly after Alex Kobelt was able to sweep on court 5 to put the Buckeyes within one point of topping the reigning NCAA & indoor champions. Despite a valiant comeback attempt by Wake Forest the Buckeyes were able to hold on and secure the Championship when Martin Joyce secured his win 7-5, 7-5. With this win, Ohio State moves to 13-0 in 2019 and the Deacons fall to 12-2. Wake’s two losses matches its season total from a season ago. The Ohio State men join the Georgia women as the Division ITA Indoor Champions in 2019. Sports Interiors are a proud partner of the ITA and we were thrilled that Chicago was selected as the site to host the tournament. Our team were able to connect with all of the other partners that were in attendance, including Playsight, and it was great to catch up with the ITA staff and discuss our shared goals for the rest of 2019. Be sure to watch this space for more exciting news coming out of our shared partnership in the months ahead. To follow up on all of the action from the weekend including the draw, scores from each match, photos & more be sure to visit the competition website by clicking here. To see a recap of the path taken by The Ohio State University to get to the title see the video clip below from their official twitter page. Up next, the best of the best in Division III will duke it out on the courts for indoor supremacy beginning the weekend of February 22 in Cleveland, OH. Good luck to all of the teams set to compete! To learn more about this upcoming tournament click here.